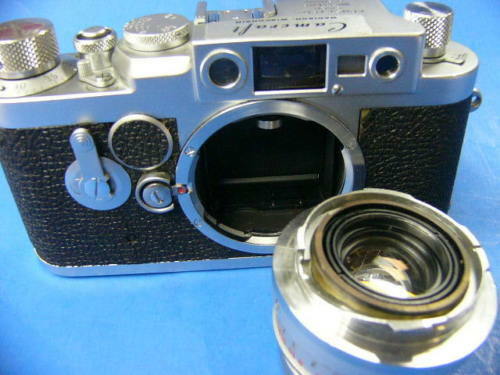 Norman Goldberg (inventor of the Camcraft N5 Motor and the Leitz New York Motor), went to Wetzlar in the late 1950’s and he was shown the Prototype Leica IIIG M Mount. He was inspired to try to convert one, and he did, he converted 5 or 6 IIIG Screw mount Leicas to M mount. This camera is still in the possession of Norman Goldberg’s son, Don Goldberg. Don has checked the camera and it is 100% functional. It is a Very Rare and Unique Camera which should be part of any serious Leica Collection, or if you prefer shooting with finest Screwmount camera Leica ever made with your modern M Mount Aspherical Glass, this is the camera for you! Don has checked All functionality and has gone over the camera with a total CLA, and the camera comes with a 1 year warranty from DAG. Do Not Pass Up this opportunity to add this to your collection! Good Luck! Now, granted, Don Goldberg is a great guy and all, and I’m sure his father has an impressive lineage with Leica cameras, but why would you pay $5600 for this so you could use “your modern M Mount Aspherical Glass” with it, when you can buy a decent IIIg for $500 and a Screwmount to M Adaptor for $25 and get the exact same thing? [*Of course, as pointed out to me almost immediately by alert leicaphile David Smith, what you would need is an M to screwmount adaptor, which doesn’t exist, for my scenario to play out. This is what happens when you blog after drinking too much bourbon. So….damn if this camera isn’t a unique IIIg afterall. But $5600? I’m not sure I see it when you can buy any number of modern SM voigtlander lenses if you’re looking to use modern optics on a IIIg. Of course, this begs the question of the value of the camera as an historic item]. In any event, somebody will buy it and be very happy they did, for whatever reason. It just won’t be me. This entry was posted in Collectible Leicas, Leica IIIg, Thread Mount Leica, Uncategorized on March 15, 2016 by Leicaphila.